I would like to invite you all to the Grand Opening of Hourglass Workout Yorkdale! 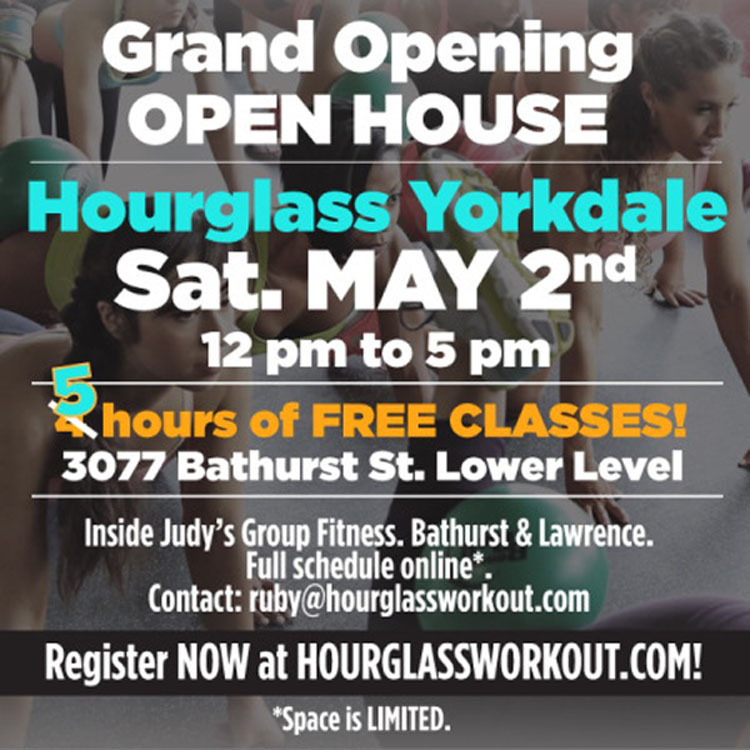 Ruby (Hourglass Workout Instructor, Owner of Hourglass Workout in Brampton) from @rubylicious_fit will be running a 5 hours of FREE classes on Saturday May 2nd from 12 pm to 5 pm at 3077 Bathurst St. lower level (North York peeps it’s only a 7 minute drive from Yonge and Finch area; And the Midtown peeps only 15 to 20 away from Yonge and Eglinton). Come take a class or two or just come and kick it with Ruby and the rest of our Hourglass fam. Our founder Lyzabeth Lopez will also be dropping by and it’s a great opportunity for you all to meet the amazing woman who started this all. We will also have Bulldog Nutrition joining us, a demo and some small snacks will be provided. Ruby and the Hourglass team are looking forward to seeing you all!